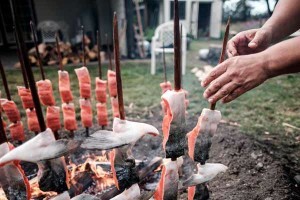 First Nations Development Institute (First Nations) has been awarded a $2.1 million grant from the Indigenous People’s Fund of Tides Foundation to support the nationwide rollout later this year of the Gather feature-length film about Native American food sovereignty efforts, as well as to fund a grant program, scholarships and trainings to further support such food initiatives in Native communities. 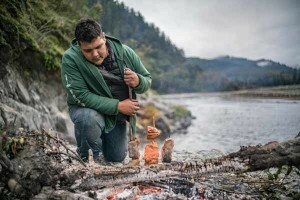 Photo of Sammy Gensaw (Yurok) with salmon, by Renan Ozturk. Image was taken as part of the “Gather” film and storytelling project about Native American food sovereignty. First Nations is involved in the production of the film. With Gather focusing on Native food sovereignty, it fits perfectly with First Nations’ longtime programming and grantmaking effort known as the Native Agriculture and Food Systems Initiative (NAFSI), which has been underway since 2002. Gather outlines the destruction and appropriation of Native food systems over years of colonialism that sought to eliminate America’s original inhabitants through many means, including the decimation of their well-established food and agriculture systems. Further, the film, which will be released in 2019, chronicles the rise of the Indigenous food movement in North America. The grant from the Indigenous People’s Fund of Tides Foundation will support dozens of local film screenings and community discussions across the U.S. It also will underwrite a new Gather-related grant program under NAFSI to further assist and enhance grassroots food sovereignty projects in Native communities over the next three years. Photo of Tolowa Nation salmon by Adam Sings In The Timber (Crow). Additionally, it will allow First Nations to provide more college scholarships to Native students majoring in agriculture or related areas, and it will enable First Nations to expand other training and technical assistance activities it provides to existing Native farmers, ranchers and other food producers. The grant also will allow First Nations to work more closely with other organizations to advance Native food sovereignty, as well as update the Native food systems website. The film features many of First Nations’ NAFSI grantees and partners, as well as others who are making huge strides in advancing Native food sovereignty as a way of asserting tribal sovereignty, reclaiming control of Native food systems, and helping restore the health and well-being of Native communities. The film project and its related journalism effort are being underwritten by the Indigenous People’s Fund of Tides Foundation and The 11th Hour Project of the Schmidt Family Foundation, respectively. Gather is being directed by Sanjay Rawal (Food Chains) and produced by Tanya Meillier and Sterlin Harjo (Seminole/Muscogee). Renan Ozturk is the director of photography. The film’s website can be found at http://gather.film/, and it can be found on Facebook at www.facebook.com/gatherfilmproject and on Instagram under @gatherfilm. This entry was posted in NL02 by rblauvelt. Bookmark the permalink. Thanks for sharing this, Connie. What a wonderfully complete project, through film to food to student scholarships.